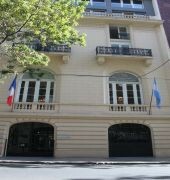 The Hotel Club Frances is located in one of the most outstanding neighborhoods of the city of Buenos Aires in the area in which its architecture is reminiscent of Paris: La Recoleta. 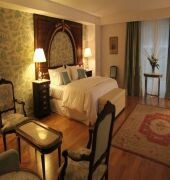 Surrounded by history and culture it is a highly valued location for tourism. The world-class National Museum of Fine Arts, also located in Recoleta, houses more than 12,000 works, and admission is free. You can walk to Republic Square to see the iconic Obelisk, and while you're there, you can catch a show in one of the theaters on Avenida Corrientes. 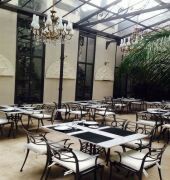 The greenhouse-style breakfast room is the sunny setting for your free morning meal, while the intimate Hotel Club Francés Restaurant serves French cuisine at dinner. For recreation and relaxation, there's a fitness room, solarium, and Finnish sauna - as well as a fencing hall. 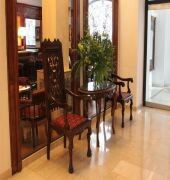 Occupying a historic, European-style building, this petite hotel has 28 spacious guestrooms and suites, all with free WiFi and luxury bedding, plus nightly turndown service includes chocolate and bottled water. Executive Suites and Executive Deluxe Suites come with jetted bathtubs.